Recently* I was perusing the section on edge matching puzzles on Rob’s Puzzle Page. While puzzles using a 3×3 square grid are the most common, one that I found interesting was the 2×3 grid “Matador” puzzle, where matches form dominoes with doubled numbers of pips. Possibly to compensate for the reduction in size, an extra rule requires that not only must edges match, but one match must be present for each pip number between 0 and 6. My first impulse was to find the simplest complete set that would work as a puzzle. There are 6 different cyclic permutations of a set of four different numbers. Why not try edge-matching with cards using these? It turns out that this is a pretty easy and not terribly interesting puzzle. However, in exploring the space of similar puzzles, I found what I think is a particularly elegant gem. 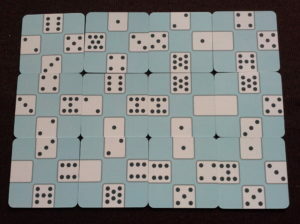 If we use cards with edge values between 0 and 8, there are 17 different sums between 0 and 16, which is the same number as the number of internal edges in a 3×4 grid of 12 cards. Coincidentally, 12 is also the number of sets of different numbers between 0 and 8 that sum to 16, so those can be the sets of numbers on our 12 cards. The last detail is the matter of how we arrange those numbers. Making all of the cards have clockwise ascending edge values is simple enough, although it hurt my symmetry senses to have to pick a direction. 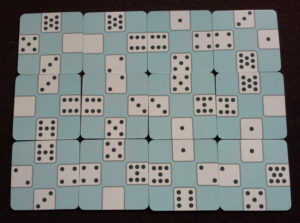 And indeed, we don’t have to, because we can make the cards flippable, so that the other sides have values in counterclockwise ascending order. 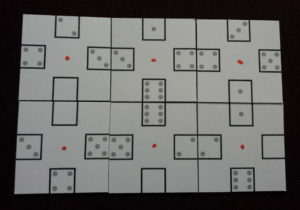 Luckily, the flippable cards are just what the puzzle needed to handle another issue: without them, the puzzle would be unpleasantly hard to solve. A third challenge is to make a 4×4 square with the corners removed such that every difference between values at the same edge between 1 and 8 occurs exactly twice. I believe I solved this at some point, but I didn’t record the solution, so I can’t show it to you right now. As you may have noticed, the last puzzle set has higher production quality than the first two. 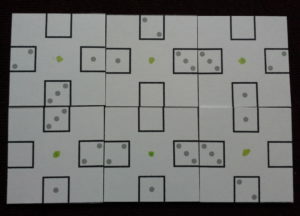 That’s because I’ve had a prototype custom deck of cards made including several different puzzle sets. I intend to have a small run of these made to sell. *By recently, I mean, whatever was recently last June, when I started writing this post. I don’t mean to only finish blog posts during the earlier part of the year, but it does seem to tend to work out that way.